Principal Cast : Charlie Chaplin, Edna Purviance, Eric Campbell, Albert Austin, Lloyd Bacon, Henry Bergman, Leota Bryan, Frank J Coleman, James T Kelley, Charlotte Mineau, John Rand, Wesley Ruggles, Leo White, Tom Wood. 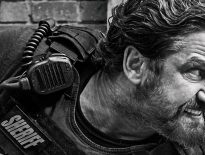 Synopsis: Charlie is an overworked labourer at a film studio who helps a young woman find work even while his coworkers strike against his tyrannical boss. Madcap silent farce from Charlie Chaplin ticks all the genre boxes for “behind the scenes on a film set” we’ve come to know and love. 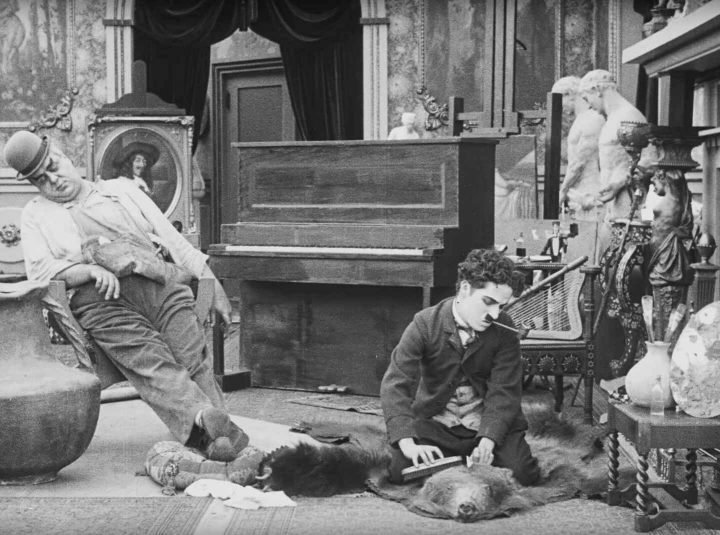 Trapdoors, pie-fights, women dressed as men, pratfalls and hilarious mugging; there’s almost no part of Chaplin’s 1916 short Behind The Screen that doesn’t have foundational comedic value within it. The seventh short film released under the Mutual Film Corporation banner, Chaplin’s command of the screen here was absolute: as director, his inventive camerawork and narrative editorial constructs are sublime, and the film’s gradually rising sense of impending hilarity is pitch perfect. A showcase for not just Chaplin but his regular on-screen ensemble – including the enormous Eric Campbell, and the hilarious Henry Bergman – Behind The Screen is a masterclass in comedy filmmaking and timing, and a really sweet story to boot. Chaplin stars as an on-set assistant at a film studio, overworked by his immediate superior, the stagehand (Eric Campbell). As he goes about organising sets for film production, the Tramp gets himself into all manner of scrapes: he struggles to contend with an enormous (fake) roman pillar, causes mayhem with a trapdoor and a series of pratfalls for the stuntmen on set, and inadvertently starts a studio-wide pie fight when asked by one of the directors (Lloyd Bacon, unrecognisable with a Rip van Winkle-esque beard) to be in a movie. 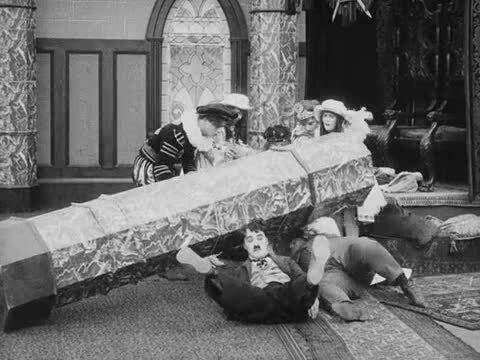 There’s a subplot involving a wannabe actress (Edna Purviance), who is initially turned away before sneaking onto the set dressed as a man, and the Tramp gets to show his acrobatic skill handling a dozen chairs all at once. 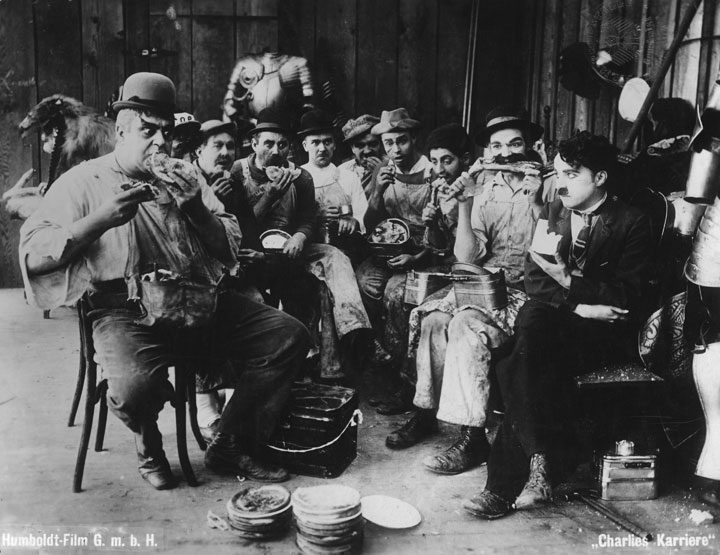 At the tail end of his 1916 production year, Chaplin’s contract with Mutual had him releasing a new short film every four weeks, a punishing schedule for rehearsal, set construction and writing. 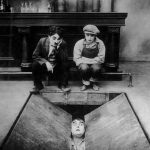 While the majority of his output to this point of 1916 had varied between excellent and forgettable, November’s Behind The Screen began a series of films that would go on to be considered among his very best. Indeed, this short film is an immaculate example of how to slowly build a story to an unforgettable climax (it’s 1916, so keep your blockbuster expectations in check, people) using then-gleaming new genre tricks, callbacks to the director’s Keystone days, and a smattering of glib, gleeful abandon. The Tramp’s affable nature and the filmmaker’s cartoonish visual style coalesced into perfection for this film, manifesting in one of the funniest final thirds I’ve seen to-date in a Chaplin short of any kind, and lampooning the very farce Chaplin made his name with. The film begins slowly, introducing our misunderstood Tramp at work on a film set, harangued by the studio boss (an engaging Frank Coleman) and accused of loafing (when in actuality, it’s Campbell’s overbearing stagehand who loafs and takes credit for work done), before exploding into an all-out frenzy by the final act. Edna Purviance’s romantic arc is fully formed, attenuated by her appearance in overalls and hat in a “mistaken for a man” scene where she smooches with Charlie, while the supporting characters offer athletic physical violence at the hands of the film’s many prop failures or mismanagement. A sequence in which Charlie tries to prevent the toppling of a massive Roman column is hilarious if (knowingly) predictable, the extensive use of a trap-door to drop unsuspecting victims has Scooby-Doo-esque flavouring, and the final act’s pie fight works brilliantly. The on-point overwrought hysteria manifested by the acting talent here transforms the short from middling comedic venture into an all-out laugh riot. One of the aspects to Behind The Screen I thought worked better here than in previous films from Chaplin was his use of the camera and editing to ramp up the laughs. Intercutting different narratives to propel the pace and comedy value was a masterstroke by Chaplin – until this point, his previous Mutual films had, with the exception of One AM, largely remained distant and aloof with camera movement, to a large extent – and it’s this immediacy and vivacity that creates the film’s memorable sense of timing and movement. Chaplin’s physical comedy has rarely been better here, eschewing that silly slapstick hard-violence for a clownish, “accidentally involved” style of performance I think works a lot better. His scene with Albert Austin, as a fellow actor, eating lunch on a break, is absolutely centimetre perfect with timing and reactions, and naturally Eric Campbell’s contribution to the film is as statuesque as the actor himself. Behind The Screen is brilliant. It’s the kind of film to define the word “timeless”, with effortless comedy, scintillating narrative weaving, and a dynamite concluding “action” sequence. For fans of Chaplin it’s simply unmissable, and for fans of cinema the short comes highly recommended as an essential glimpse into Chaplin’s career as a filmmaker. While it might lack the emotional resonance of, say, his later work in The Immigrant, this film delivers the frothy, effortless comedic prowess for which the Tramp was best known and beloved. 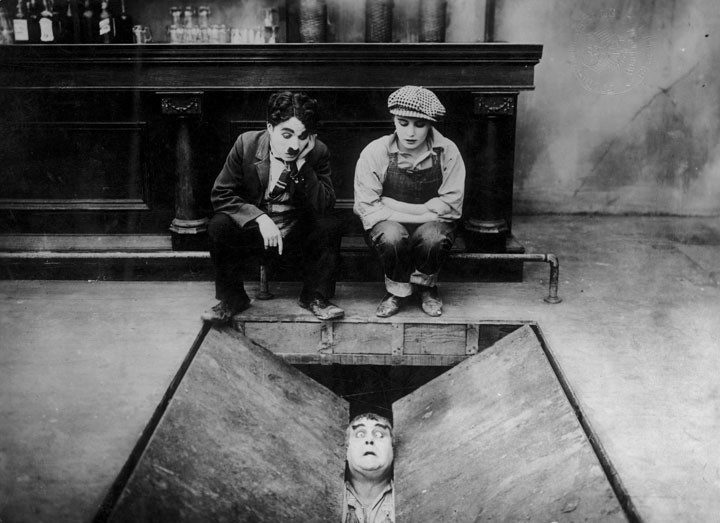 Behind The Screen is must-see silent cinema.